#041 The Will Of God | That's In The Bible? « #040 What About The Heathen? The “will of God” is a reference to what God wants you to do in your life. There is nothing more important than you loving the Lord and doing His will for your life. Are you doing the will of God? Find out how you can know the will of God for your life in this podcast. Somewhere along the way in your Christian life you will be introduced to the term and subject of the will of God. The term “will of God” shows up 23 times in the Bible. The “will of God” is a reference to what God wants you to do in your life. There is nothing more important than you loving the Lord and doing His will for your life. The will of God involves what God wants you to do as your life’s work; and, it also involves things God wants you to do on a regular basis that may not be peculiar to your individual calling. That is, things that He wants you to do just because you are a Christian. These two areas correlate generally with what may be called the revealed will of God and the concealed will of God. Sometimes people look too far ahead, trying to figure out what God wants them to do in the future, while failing to realize that God has something He wants them to do today. The truth is if you’re not doing what God wants you to do today, you will not be properly ready to do what He wants you to do down the road. Consequently, the will of God starts with doing God’s will today. In the word of God, the Lord has revealed plenty of specific things that He wants us to do right now. Our Christian walk begins when we begin to put those things into practice. The revealed will of God consists of things that we are clearly told to do, or not to do in the Bible. These are things we are to do just because we are saved. We don’t have to pray about whether or not we should put them into practice because God has already told us in the Bible what to do regarding these matters. The following are some examples of the revealed will of God; things for every Christian to obey. The word sanctify means to set apart (see Ex. 13:1-2, 12). It is God’s desire that you set yourself apart from sin and set yourself apart to God for His glory. See Rom. 12:1-2 & I Cor. 6:19-20. If the Lord is to use you for His glory, you need to be a clean vessel (Is. 52:11). It is the will of God for a Christian to give thanks for whatever circumstances he finds himself in. Instead of worrying yourself to the brink of insanity, step back and realize that God is still on the throne and He knows what’s going on in your life and He can handle it. Then, thank him for it. It may be hard, but it is His will. And it is a sacrifice with which He is well pleased (Heb. 13:15-16). Doing so helps to take the burden off you and release the pressure that’s been building up inside of you. Because you are a Christian, some people will persecute you. (Assuming you make up your mind to live a godly Christian life II Tim. 3:12). We must learn to respond to such persecution and criticism with well doing. See Matt. 5:44 & Rom. 12:14. Doing so will prevent our detractors have having any legitimate criticism of us (Titus 2:7-8). a.) Reading your Bible daily (Is. 34:16, etc). b.) Attending church regularly (Heb. 10:25). c.) Praying (I Thess. 5:17). d.) Witnessing (Mark 16:15, etc.). e.) Be faithful (I Cor. 4:2). There are also a number of other things that the Bible instructs you to do. The ones we have listed are foundational and they will get you off to a good start and keep you busy for a good, long while. Whatever else the Lord shows you to do, these things should always be a part of your Christian life. There is no mystery to them. They are plainly revealed in God’s word and are the revealed will of God. There is another aspect of the will of God that is not so readily revealed to us. This has to do with God’s particular calling on the life of an individual. Since this calling varies from person to person according to God’s purpose for that person, it is not always so easily seen, just by looking in the Bible. Indeed, looking in the Bible, will help the individual to discern the will of God (more on that later), but he may not find it spelled out so clearly as the particular things mentioned earlier regarding the revealed will of God. The concealed will of God is not meant to be permanently concealed. It is meant to be searched out and discovered. Note that even as “the honour of kings is to search out a matter”, those of us who have been washed in the blood of Christ have been made “kings and priests unto God” (Rev. 1:5-6). God desires for us to search out the matters of His will and calling for our lives. To do this, the following means may be employed. A.) Prayer – The following verses will be of great value regarding praying for the will of God. Prov. 3:6; Ps. 27:11; Ps. 143:8, 10. B.) Yielding – You must be yielded to the will of God if you hope to be able to discern it. See Lk. 22:42; Prov. 16:9; 21:2. C.)	Bible – One of the practical reasons for reading the Bible regularly is that it divides the soul from the spirit (see Heb. 4:12). Your soul is what you want; the spirit is what God wants. Regular Bible reading will help to keep your will divided from God’s will so that you can clearly discern what He wants you to do. D.)	Preaching – Listening to preaching can help you discern God’s will for life. After hearing John the Baptist preach, Andrew and another of John’s disciples followed Jesus. (See John 1:35-37). God can use preaching to enlighten you as to His will for your life. E.)	Godly Counsel – See Psalm 1:1; Proverbs 11:14; 15:22 & 24:6. F.)	Fasting – In Acts 13:2, it was dur-ing a period of fasting that God revealed His calling to Barnabas and Saul. Isaiah 58:10 says that during a proper Biblical fast, “then shall thy light rise in obscurity, and thy darkness be as the noon day”. God will often shed some light on your darkness through prayer and fasting. G.)	Obedience – If you want to know what God wants you to down the road, be obedient to what He wants you to do today. For if you won’t obey the light that you’ve got now, why should God give you any more light? The way to be in the will of God 10 years from now, is to make sure you are in the will of God and doing the will of God today. Then tomorrow make sure you are doing the will of God, and the next day, and the next day and so on. The revealed will of God is right regardless of the Lord’s calling on your life. So if you are having trouble discerning His calling, you can’t go wrong doing His revealed will. In seeking the will of God, you should remember that the will of God will never run contrary to the word of God. That is God will never ask you to violate His word. Any prompting to do this is not from God and can be immediately dismissed as a possible course of action. May this also be your delight, to do the will of God for your life both now and forever. David “served his own generation by the will of God” (Acts 13:36); may you likewise serve yours. 1. List and explain the two major aspects of the will of God discussed in this lesson. 3. List five things from our lesson that the Lord has revealed to us as being His will. 4. 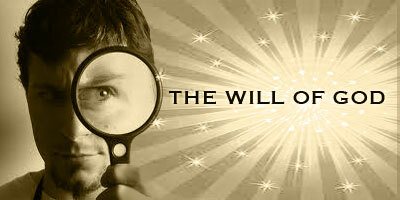 List at least five ways to search out and discern the will of God for your life. 5. The will of God will never run contrary to_____________. As mentioned in this podcast – If you would like to receive an email notification each time we post a new podcast episode of “That’s In The Bible?” send an email to thatsinthebible@gmail.com . This entry was posted on November 8, 2010 at 8:19 pm and is filed under That's In The Bible - Podcast. You can follow any responses to this entry through the RSS 2.0 feed. You can leave a response, or trackback from your own site.